The men’s 100m final only has three teams – Cornell, Princeton, and Brown, the bulk of which are in Red and Orange/Black. Cornell rookie Zach Menchaca has the fastest seed time and preliminary time, while Princeton’s Carrington Akosa and Charles Volker have the potential to upset Menchaca when racing head-to-head. Fair start for the field, and while Menchaca did not have the best start but he pulled away in the final 50m to get his first title in 10.41 – tied for fourth best in meet history and tied for sixth in conference history. Akosa also broke 10.50, getting runner-up in 10.49, ninth best in meet history. Cornell got 17 points to Princeton’s 14 in this event, with five scorers being either a freshman or a sophomore. The latest field result comes from the women’s javelin, where Penn’s Kelsey Hay became the second woman in Ivy history to win three titles in this event. She won in 152-07, while her teammates Serena Graf and Lisa Sesink-Clee finished fifth and sixth. 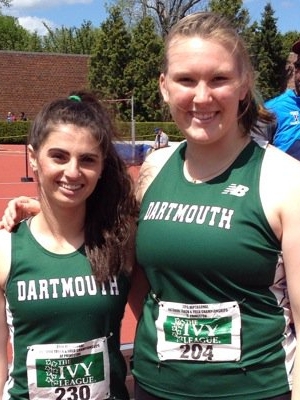 Dartmouth also picked up some good points as Olivia Wiener and Bridget Douglas finished second and fourth, while Kacie Hargett of Cornell was third. The women’s 100m title was decided by the 50m mark as Harvard’s Gabrielle Thomas pulled away from the field at that point to win by 0.25 seconds over teammate Nzogi Musa – 11.55 to 11.80 – to give Harvard another 18 points in the team battle. Thomas’ mark is a new meet record, but it was the slowest 100m time Thomas has run so far this year. But note – it was run into a headwind. The men’s high jump title went to the defending champion Mylez Lazarou of Cornell with a new season’s best height of 7-00 1/4. There was a three way time for second place at 6-11 with Cornell’s Stephen Afadapa, Penn’s Mike Monroe, and Princeton’s Xavier Bledsoe. Second place is the best ever finish for Afadapa at a Heps championships. Decathlon leader Austin Jamerson finished fifth in this event with 6-09 3/4, while Penn’s Ian Kirk was the final scorer with 6-08 3/4. Princeton looks to close in on the gap with Cornell in the men’s 800m final as Princeton has two athletes – Josh Ingalls and Noah Kauppila – while Cornell does not have any finalists. Could get a 1-2 finish? The field will be tough. Harvard’s Myles Marshall was first at the break but Brown’s Ned Willig took over the lead after 300m and has the lead att he bell in 53.29. Columbia’s Alex Sauer was in third at the bell behind Marshall. Willig has a 10m lead with 100m to go and Marshall begins his move in the final stretch but Willig holds on to grab his first outdoor individual title – 1:48.63 – in his final Heps individual race of his Ivy career. Willig’s time is just outside the top-10 in meet history. Marshall finished second with 1:49.16 while Sauer was third in 1:49.38. Kauppila was the only Princeton scorer in fourth place. The women’s triple jump resulted in two women named Williams going 1-2, like they did in Indoor Heps… but it was a different lineup as Columbia’s Anna Williams won her first Heps title with a distance of 42-04, a new personal best and ninth best in conference history. Brown’s O’Sha Williams – who won the Outdoor Heps long jump title yesterday – was in second with 41-10 1/2, tying her season’s best. Columbia also grabbed third place with Adefunke Sonaike with a distance of 40-07 3/4. The women’s 800m is a pretty open race without Princeton’s Cecilia Barowski running, but it will still be competitive with Columbia’s Sarah Hardie, Yale’s Shannon McDonnell, and Princeton’s Ashley Forte in the field. Hardie, Forte, and Brown’s Taylor Worthy were even at the bell to run 67 for the first 400m. With 200m to go, Forte was on the inside while Worthy was on the shoulder. But going into the final 100m Columbia’s Brittney Wade sprinted out from sixth place into the lead and steals the win by 10 meters in 2:10.23, while Hardie made her move after Wade and finished in second place in 2:11.12. The final 200m split of 30.5 for Wade, who is usually a front-runner. Shannon Hugard of Cornell finished in third with 2:11.70 while Forte dropped to fourth in 2:11.78. Due to their strong finishes in the 800m and triple jump, the Lady Lions move into fourth place in the team standings and is in striking distance to overtake Cornell for third. 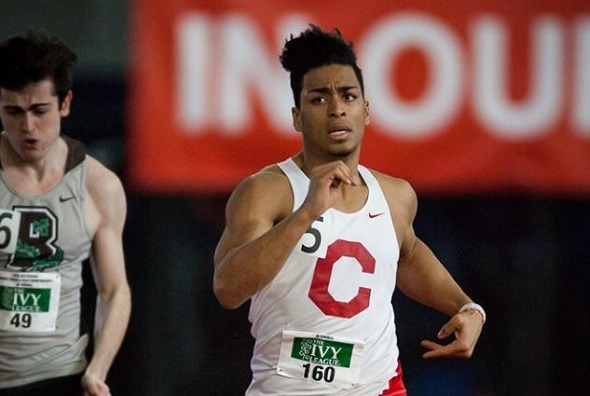 Princeton is looking for their four athletes to score well in the men’s 400m hurdle finals as Cornell only has one athlete, but that one athlete is Max Hairston. Hairston made up the stagger quickly in the first 100m and had a good gap on the field in the final 100m. But Princeton’s Greg Leeper found his final gear in the final 100m and challenged Hairston after the final hurdle, ultimately nipping him at the line to get the title by 0.03 seconds, 52.28 to 52.31. Princeton got 22 points to Cornell’s 8 – Princeton goes 1-3-4-5 – to close the gap to only 3 after 16 events. Six events remain. The women’s 400m hurdles is expected to be another high scoring event for Harvard as Autumne Franklin and Jade Miller have the top 2 seed times going into the meet, but Cornell’s Taysia Radoslav could spoil the party as these three women are the only athletes to go sub-60 – actually, sub-58. Miller is the two-time defending champion in this event while Franklin has the second best time in conference history but has never won this event. Radoslav ran a new personal best yesterday to have the top time going into the finals – 57.66. The final’s start was clean, and Miller, Frankin, and Radoslav pull away from the rest of the field early. Franklin leads at the 200m and has a 5m lead over Miller and Radoslav going into the final 100m. Franklin holds on and manages to set a new meet record in 55.87 – #2 in Ivy history. Miller held off Radoslav for second place, 56.44 to 56.48. Radoslav’s time is a new personal best and the top 3 times are all under the previous meet record of 57.30 (held by Miller set last year). This entry was posted on Sunday, May 8th, 2016 at 1:25 pm. It is filed under Heps Champs, Spotlight. You can follow any responses to this entry through the RSS 2.0 feed.